When you buy a stock, you become part-owner of a company. When the company does well, its stock price generally goes up; when it falters, so do its shares. You can buy or sell your stocks whenever you want. Stocks can zigzag wildly in value, and stocks of individual companies sometimes go completely bust. But over the long haul, and as a group, stocks are a good bet. Over time, stocks have returned about 10% annually on average. When you buy a bond, you’re loaning money to a company or government entity. By selling you the bond, the issuer agrees to pay you back with interest over a certain amount of time. Since most companies and governments pay back their debts, bonds are as a whole considered a safer investment. The downside is they don’t earn nearly as much money as stocks, returning an average of 5% annually. Most people select a mix of stocks and bonds for their portfolio, including more stocks if their risk tolerance is high and more bonds if it is low. Instead of picking stocks and bonds one-by-one for their portfolio, many investors buy mutual fund or exchange-traded fund (ETF) shares. A mutual fund is a basket of securities, like a ready-made portfolio. Mutual funds can invest in almost anything, including stocks, bonds, real estate, and commodities. Index funds track a benchmark, such as the S&P 500, meaning they match the market’s returns. Actively managed funds try to beat the market. Unlike ETFs, with mutual funds, you can only buy or sell shares once a day. 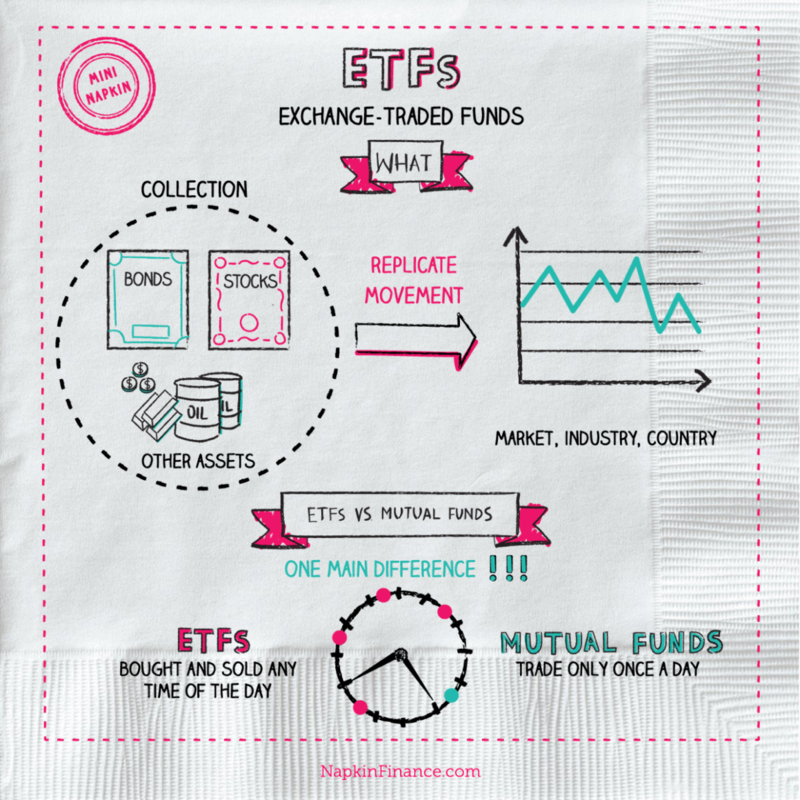 ETFs are mutual funds, but their shares trade on exchanges like a stock. That means you can buy and sell shares throughout the day. Most ETFs are index funds. Real estate: You can invest directly in real estate by purchasing a rental property or indirectly by putting your money into real estate investment trusts (REITs). Commodities: Gold, oil, timber, and other commodities can swing wildly in price, so these investments are generally considered high risk. Collectibles: From art to stamps, wine, coins, and everyone’s favorite regret—Beanie Babies—collectibles can make for fun hobbies but unpredictable investments. Hedge funds: These are generally high-risk, high-fee investment funds that are only available to wealthy investors. Startups: Investing in startups can take many forms—from loaning your friend $1,000 to backing companies through a crowdinvesting platform. This approach comes with the potential to lose it all (or maybe make it really, really big).